One of the most active volcanoes in North America is a threat to international and local air traffic. 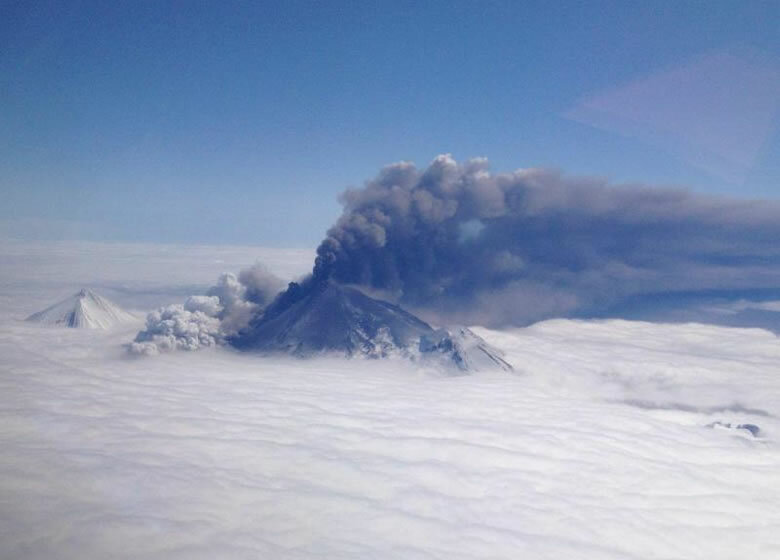 Pavlof Volcano: Ash plume from Pavlof being carried by the wind, May 18, 2013. Photograph by Brandon Wilson. Image from the Alaska Volcano Observatory. Pavlof ash plume: Pavlof volcano and an eruption plume photographed from a commercial flight on August 30, 2007. The plume is about 17,000 feet tall. Little Pavlof is the smaller peak on Pavlof's right shoulder. 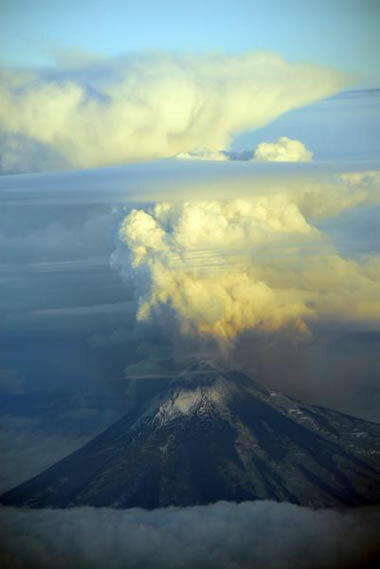 Eruptions like this are a severe hazard to local and international air traffic. Photograph by Chris Waythomas, Alaska Volcano Observatory / U.S. Geological Survey. Map: Where is Pavlov Volcano? Where is Pavlov Volcano? Map showing the location of Pavlof Volcano near the end of the Alaska Peninsula. The boundary between the North America Plate and the Pacific Plate is shown by the gray toothed line. The Pacific Plate is to the south of the boundary, and the North America plate is to the north of this boundary. The A-B line shows the location of the cross-section below. Plate tectonics of Pavlof: Simplified plate tectonics cross-section showing how Pavlof Volcano is located on the Alaska Peninsula. A subduction zone, formed where the Pacific Plate descends beneath the North America Plate, is directly below the volcano. Magma produced from the melting mantle and Pacific Plate rises to the surface and causes eruptions. Pavlof is located near the western end of the Alaska Peninsula. 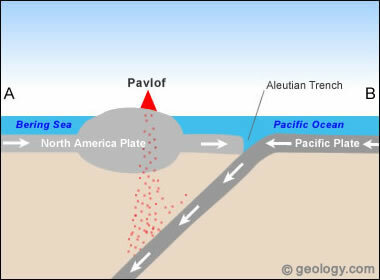 The convergent boundary between the North America Plate and the Pacific Plate is located to the south and east of Pavlof as shown on the map above. The North America Plate is moving in a southerly direction, and the Pacific Plate is moving towards the northwest. At this location both plates consist of oceanic lithosphere. At the plate boundary, the Pacific Plate is forced under the North America Plate to form the Aleutian Trench and a subduction zone. A diagram of this plate boundary situation is shown in the simplified cross-section on this page. Pavlof 2007 eruption: Photograph of Pavlof Volcano (erupting), Pavlof Sister (left) and Little Pavlof (small peak on the right shoulder of Pavlof) taken on August 29, 2007 by Guy Tygat. Alaska Volcano Observatory image. The Three Pavlofs: Photograph of the three Pavlofs. From left: Pavlof Sister, Pavlof, and Little Pavlof (small peak on the right shoulder of Pavlof) as observed from Trader Mountain in August 2005 by Chris Waythomas. Pavlof Sister and Little Pavlof have not erupted during recorded history but have probably erupted within the past 10,000 years. Alaska Volcano Observatory image. The chart on this page summarizes the eruptive frequency of Pavlov for which there is a written record. The small number of eruptions in the early portion of this record reflects the remote location of the volcano, the lack of local population, and the poor weather conditions that limited observation. Eruption frequencies in the 1700s, 1800s and early 1900s are underrepresented. 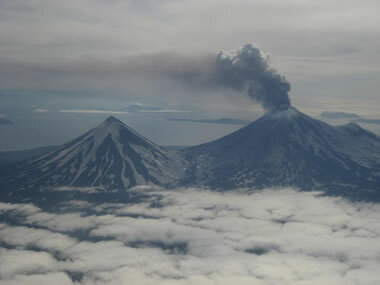 Most of Pavlof's eruptions have involved low-energy ash releases, minor andesite lava flows, or minor lava fountaining. These sometimes produce lahars when ash and lava melt portions of Pavlof's snow cap. Some of these lahars have been large enough to reach the Pacific Ocean to the south or the Bering Sea to the north. 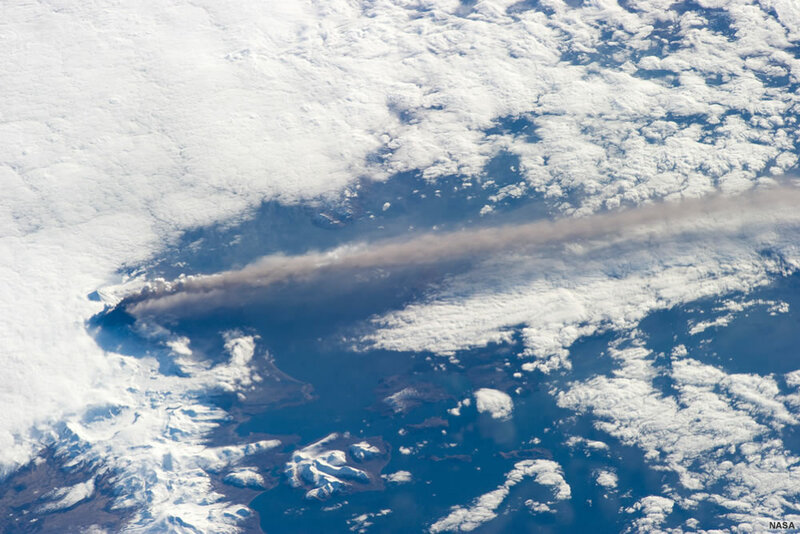 Pavlof 2013 eruption: Astronauts aboard the International Space station captured this photo of Alaska's Pavlof Volcano erupting on May 18, 2013. 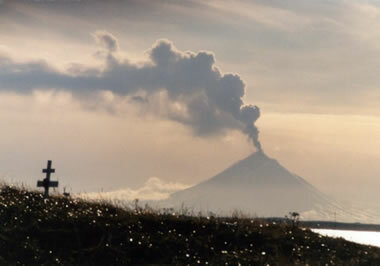 This view shows an eruption plume initiating from Pavlof Volcano (left side) and being carried by strong winds to the southeast. Pavlof Sister is visible above and slightly to the left of Pavlof in this image. Photo published by NASA's Earth Observatory. Enlarge image. Pavlof Lahar Deposits: Lahar runout deposit produced during the 2007 eruption at Pavlof. It is a sandy matrix-support deposit with a mix of volcanic ejecta and stream pebbles. Image by Chris Waythomas. USGS image. Enlarge. Video of a lahar produced during the 2007 eruption of Pavlof. In the video you can observe the front of the lahar sweeping down the channel. Other larger lahars exceeded the capacity of the channel and produced the sediment-covered landscape around the channel. Filmed by pilot Jeff Linscott of JL Aviation. Alaska Volcano Observatory video. Although eruptions at Pavlof have been numerous, they have fortunately been small to moderate in size. 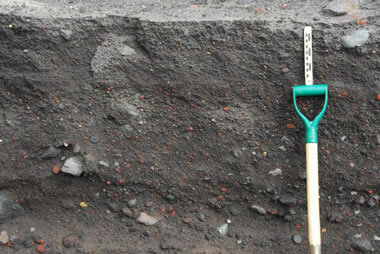 They are often Strombolian eruptions that produce local falls of tephra. Pavlof also produces ash plumes that can be carried hundreds of miles by the wind. 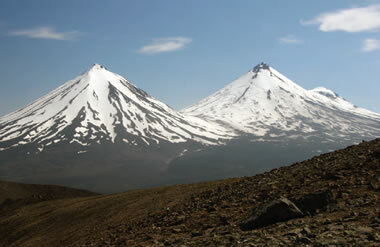 Pavlof has not been a deadly threat to people on the ground because very few people venture near the volcano. The nearest community is Cold Bay, about 35 miles to the southwest. Other nearby communities include King Cove, Nelson Lagoon and Sand Point. All of these are beyond the reach of lahars and pyroclastic flows; however, each of these communities has experienced ash falls from eruptions at Pavlof. Ash plumes are the most significant hazard associated with eruptions at Pavlof. They are a major hazard to local aircraft and a threat to international air traffic when they reach significant height. This is why the volcano is monitored with instruments and why satellite images of the volcano are examined daily. Pavlof is usually covered by snow and ice. Eruptions can quickly melt significant amounts of snow and ice to produce volcanic mudflows known as lahars. These lahars are fast-moving slurries. They can fill stream valleys with hot water, sand, gravel, boulders and volcanic debris. They destroy stream habitat, which can be lost for many years after an eruption. They travel at very high speeds, and anyone in stream valleys below the volcano when an eruption occurs must quickly move to high ground to escape the deadly flow. Pavlof eruptions often produce pyroclastic flows. These are hot clouds of rock, gas and ash that sweep down the flanks of the volcano at speeds of up to 100 miles per hour. They are dense enough to knock down trees and hot enough to incinerate everything in their path. Lava flows are produced by many Pavlof eruptions. They are generally not a hazard to humans because they move slowly, their flow path is predictable, and they generally do not travel far from the volcano. Pavlof 1996 eruption: A photo of Pavlof Volcano taken on November 13, 1996. This image shows Pavlof's steep stratovolcano geometry. This eruption began on September 15, 1996 and ended on January 3, 1997. It produced numerous steam and ash eruptions, strombolian eruptions, lava fountains and lava flows. USGS image by Elgin Cook. 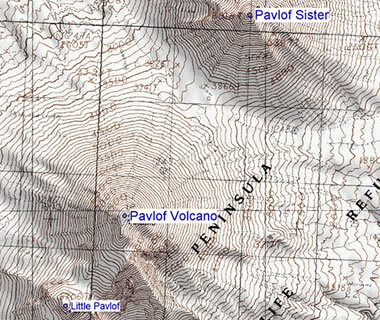 Pavlof Topographic Map: USGS topographic map of Pavlof and surrounding volcanic features. Enlarge. Pavlof Activity Page: Alaska Volcano Observatory. 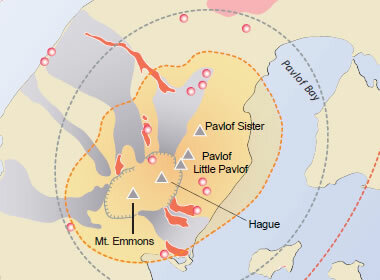 Pavlof Volcano Summary: Smithsonian Institution, Global Volcanism Program. Preliminary Volcano-Hazard Assessment for the Emmons Lake Volcanic Center, Alaska: United States Geological Survey, Scientific Investigations Report 2006-5248, 2006. Preliminary Volcano-Hazard Assessment for the Emmons Lake Volcanic Center, Alaska: (accompanying maps) United States Geological Survey, Scientific Investigations Report 2006-5248, 2006. Pavlof Volcano gets a lot of attention because it produces a small eruption every few years, making it one of the most active volcanoes in North America. It has the ability to cause temporary air traffic disruptions, but it ranks far below a major threat to local populations and the planet in general. The eruptive history of the Emmons Lake Volcanic Center includes several large caldera-forming eruptions. Between three and six major caldera-forming eruptions have occurred there in the past 400,000 years. Estimated dates of these major eruptions are around 294,000, 234,000, 123,000, 100,000, 30-50,000, and 26,000 years ago.